Did you know that diabetes can be controlled with the help of aerobic activity? As strange as it sounds, aerobic exercises are claimed to lower the need for insulin. Not just that, exercising on a regular basis reduces one’s level of stress and sugar in blood simultaneously. 150 minutes per week of this exercise is all you need to get yourself feeling all sturdy and healthy again. Plus, it is also a well-known fact that exercising contributes to your overall well-being. 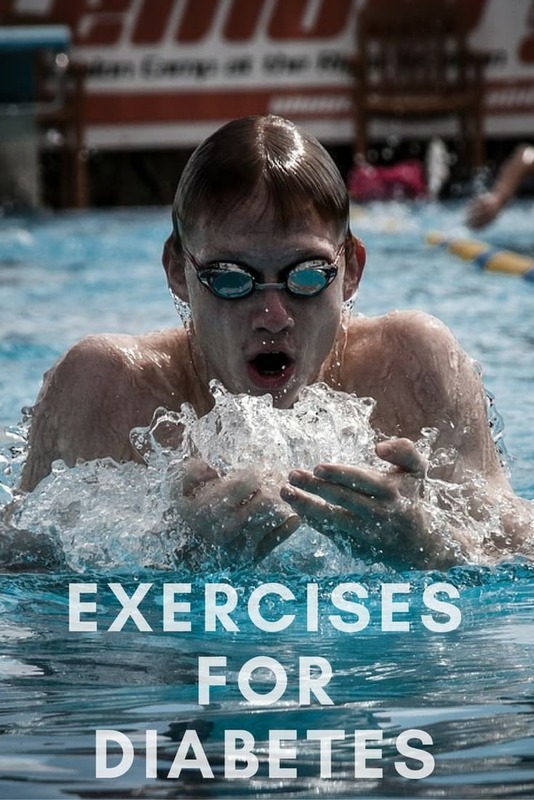 Thus we present to you, six of the best exercises for diabetes. Dancing is not just great for your body but also helps to improve memory. Remembering the steps and sequences helps to boost brain power which contributes to an improvement in memory. It is claimed to be a great exercise for people with diabetes as it promotes weight loss, increases physical activity and improves flexibility, thereby lowering blood sugar levels. Individuals with limited physical abilities can resort to chair dancing. Half an hour of dancing can burn up to 150 calories. Swimming is another great exercise for diabetes as it relaxes your muscles without exerting too much of pressure on your joints. If you have diabetes or are at risk of developing it, then swimming is what you need as it lowers stress levels, burns calories and improves cholesterol levels. Swim at least three times a week for about ten minutes and gradually stretch the duration out. Remember to monitor your blood sugar levels regularly. Walking is certainly one of the easiest exercises for diabetes, especially for those who are diagnosed with type 2 diabetes. All you require is a good pair of shoes and somewhere to go. Brisk walking can raise your heart rate, and this helps to reduce your blood sugar levels. Three times a week should do the trick, totaling up to about 150 minutes per week. It is recommended that people shouldn’t go more than two consecutive days without an aerobic exercise session. It is because when you exercise, there is an improvement in insulin production. If there is too much of a gap between your workout days, then the production of insulin slows down. It is a traditional Chinese exercise which uses slow, smooth body movements to relax the body and mind. It also increases vitality, energy, and mental health. Tai Chi comprises a series of actions that are performed in a slow, relaxed manner over a span of thirty minutes. It has been practiced for centuries now and is an excellent choice for people with type 2 diabetes. Apart from improving stress, it reduces nerve damage, a commonly caused complication by diabetes. Yoga incorporates fluid movements that build strength, balance, and flexibility. It helps to lower stress, thereby improving nerve function which in turn leads to an increased state of health and wellness. Yoga is also effective to improve blood glucose levels due to the improved muscle mass that comes with consistent Yoga practice. That’s not all; apparently, Yoga helps to lower body fat and fight insulin resistance too. Cycling is not just good for your heart, but also helps your lungs function better. A stationary bike is the most ideal for people who have diabetes. Stationary cycling helps to improve the blood flow to your legs which is highly beneficial. It also burns calories, thus maintaining a healthy balance of weight too. Now that we have covered the exercise aspect to keeping a check on diabetes; let us consider the ways in which you can monitor your rising blood sugar levels. It helps to evaluate if you are meeting treatment objectives. It helps to measure if your medication is impacting your blood glucose levels. It helps to recognize how factors such as illness and stress can affect your blood sugar. Three main tools determine the levels of glucose in your blood. They are Blood Glucose Meter, Glycated Hemoglobin (HbA1c) test result and Continuous Glucose Monitor (CGM). A blood glucose meter provides the most accurate real-time blood glucose level as it gives you an immediate glucose capillary result. This capillary result is then used in the determination of hyperglycemic and hypoglycemic conditions. Generically, 4 or 6 blood glucose checks in a day help to optimize control as it provides 4 or 6 snapshots of blood glucose levels. There may be multiple products present in the market, but only one stands out is Alere G1 Glucometer. This glucose meter uses Gold Biosensor technology, meaning it has a pure gold electrode in test strips which makes it more efficient and accurate. Its strips use Glucose dehydrogenase (FAD) enzyme as a catalyst so as to prevent any reactions from oxygen, maltose and galactose, which are commonly found in blood, thereby giving a more accurate result with minimal variance as compared to other popular products in the market today. It is also auto-coded. A unique feature in this glucometer that makes it our pick is the automatic strip ejector. No manual touch is required to dispose of the used strip preventing chances of infection. This extra care for hygiene for no additional cost, impressed us enough that we thought it has to be shared with all our readers. The strips, which contain pure gold, are priced the cheapest. Check out Snapdeal & Flipkart to make self-comparisons. Remember, your budget goes off gear on repeated strip purchase. Unlike many other tools, the glucometer is only a one time investment. It is yet another tool to determine the level of glucose in your blood. It provides you with an average reading of your glucose control over the previous two or three months. It helps to capture chronic hyperglycemia better than most other monitoring devices. Fasting is not required for an A1c assessment. The downside, however, is that you can only know after weeks how your treatment, diet, and exercise regimen are faring since this test provides meaningful information only when repeated after 8-12 weeks. CGM is one way to measure glucose levels right through the day and night continually. A single electrode is inserted under the skin which helps to measure the glucose levels beneath the tissue fluid. This electrode is connected to a transmitter which sends the information to a monitoring device. This device helps to detect and notify you, alerting you if you reach your glucose limits. With these blood glucose monitoring devices that are widely available, keeping a check on your glucose levels was never this easy. Exercises and keeping a tab on your sugar levels are the two things you must never compromise to keep diabetes at bay.